The black rose is an OFF- blade designed to suit the needs of ambitious players. Made in Sweden, it displays an attractive Swedish design and is known for providing a ‘pure ball feeling.’ If you are looking for a blade to help you soar high in your table tennis career, you can consider this blade. The JOOLA Black Rose consists of 7 plys of quality African coating. The veneers enhance the stiffness, stability, and durability of the blade. The layers are made of Santos, Koto, and Ayous wood materials. The premium wood ply choice and unique drying process ensure stability and consistent bounce. The blade offers an efficient balance between optimal control and high speed, making this blade suitable for every ambitious player. The blade measures 90-95 grams. It is a reasonably substantial blade with high control. The heavyweight is beneficial in blocking and flipping against underspin. With this blade, you are assured of explosive topspins from both long and mid-distance. Also, the blocks are super strong, guaranteeing many wins. The heavy Black Rose is efficient in looping. It allows players to play loops with confidence with simple gear changes while maintaining precision. Since it is a weighty blade, it is recommendable to use single rubbers not to increase the weight. Regarding the head size, the blade measures 150x162mm. The size is sufficient to offer a maximum surface for ball bounce. The head size is also perfect for blocking. The JOOLA Black Rose meets the needs of players who prefer either a straight or flared handle. The functionality of the blade is similar despite the handle type. The choice of the handle depends on a player’s preferred option. Both the straight and flared handle is perfect in offering a tight grip. The grip size is concave, preventing the blade from slipping off while playing. The blade has control rate of 74 and has a close resemblance to the Viking blade. Whether a beginner or a professional player, the Black Rose guarantees perfect performance and fantastic play. It is a high quality blade for all ambitious players. The performance rating of this paddle shows that it is a blade worth having. It is compatible with JOOLA rubbers. You can choose the kind of rubber that will enhance performance and comfort while playing. Being a JOOLA brand, you are guaranteed of many years of play without regrets. If you are an OFF player, the OFF- JOOLA Black Rose is worth a try. 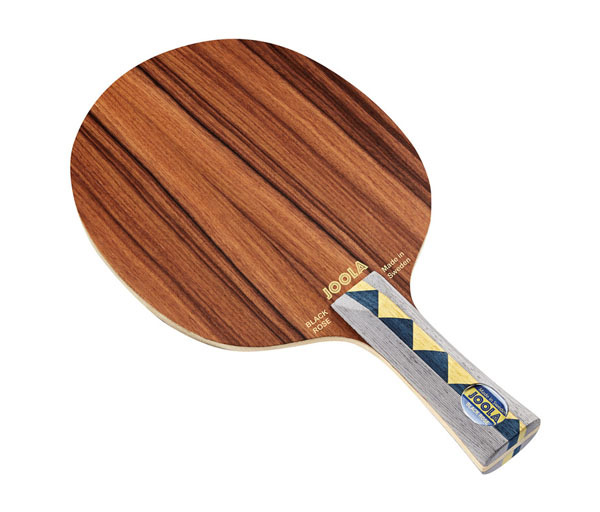 The blade is made of premium wood ply choice and passed through a particular drying process that ensures stability and guarantees you consistent bounce. Also, the blade offers an efficient balance between optimal control and high speed, making this blade suitable for every ambitious player. It is affordable and available on online sites such as Amazon. The price is reasonable and aligns with the quality and efficiency of the blade. If you need to try a reasonably massive Off- blade, you may consider this. You may check out more different brands of table tennis blades where you may find an ideal blade for yourself.